Welcome to our tribe! A tribe you probably didn't plan on being in, one you really don't want to be a part of, but one you've been thrown into! This is the tribe of the parents of children with special needs. A tribe is a group of people, large or small, who are connected to one another. This is exactly who we are. We are a tribe of parents who have children with special needs. We are some of the only people who truly understand what you are going through. We understand how you feel when you get that look from strangers when your child may be having a sensory overload in the middle of the store. We understand how exciting a milestone (that others find little) can be. We also understand the disappointment when you go to a doctor appointment and hear some MORE bad news. Our friends and family will tell us they understand, but they really don't, not because they don't want to understand but because they don't go to sleep every night worrying if they are doing enough therapy, doing the right medical procedure, having enough social groups, what tomorrow might hold, will they have friends (and the list goes on and on). I am not implying that parents of "typically" developing children (I'll touch upon that word "typically developing" in another blog post) don't have fears that are just as deep and scary as ours, they are just different. I have been on this journey for almost two years now. I am no expert and I learn something new on a daily basis, but I do have some tips that have helped me survive! 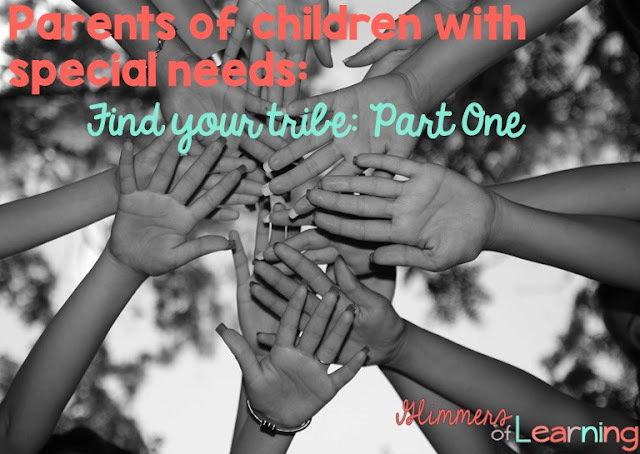 I had planned on sharing numerous tips in this blog post but my first tip and section got REALLY long, so instead I will bring you a tip or thought on our tribe (special needs parents) at different points in time. This is the most important thing for our children! You need to find therapist's, teachers, etc, who share and understand your dream and wishes for your child. I have found some of the most amazing therapists who support me and love my daughter. You therapist need to enjoy your child and understand them, so when they are having a not so good day, they aren't frustrated or annoyed with them. I have had therapists who are well intended but don't understand my daughter or don't agree with our thoughts or share our same end goal. I would receive notes and progress reports which included very little to no positives about my child. I dreaded reading those notes, it honestly made me sick to my stomach seeing that yellow piece of paper every week. With four months left in the program we received a new therapist and thankfully those notes became MUCH more positive! I didn't dread those yellow pieces of paper anymore, they always started with a positive! Thank the lord! (TIP: if you are a special needs provider, ALWAYS start with a positive!) I don't know if she really understood our end goal or believed in it, but at least she was positive. This is when I came to the conclusion that I am her parent and I know what is best and what my child needs. Do I know what medication she needs for a cold, or how to stitch up a gash when she falls. No, not at all, but I do know I have the best doctor for her as we searched and did research before she was born. After meeting the doctors and choosing our primary physician I know we made the right choice! So why don't we feel we can do this with our children's therapists?! 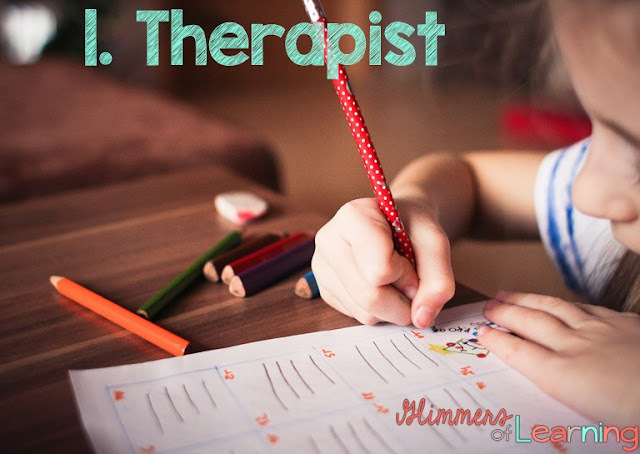 I know that in the school setting it may be more difficult as there may only be one therapist in the building, but if you are taking your child to therapy outside of the school setting DO NOT SETTLE, don't put up with the nasty notes, or the fact that you don't feel comfortable or welcomed in their office! Make a change, you will be glad you did! In the school setting if you feel that it isn't a good fit check to see if there is another option. There usually will be with a teacher and I suggest switching ASAP! Moving your child to another class won't be as horrible as being in a classroom with a teacher who may not like them or think they are capable! My child's therapists are amazing; we are so blessed and these are some of the qualities they possess and many more! I bet you think that all therapists will love your child like you do, but that is not always the case! If they don't enjoy your child those days when they may be having a melt down or just refusing to work will be stressful on them as well as you as you will sense their frustration! As children get older and things become harder, this may change, but as a little kid they should enjoy the majority of what they are doing in therapy as it should be fun and they should not see it as work but more of a play setting/activity! My daughter is sitting at the glass doors waiting for her speech therapist to come get her! Speech is really tough for her and it could be a place where she hates to be, but her therapist makes everyday fun for her and she enjoys going!! I know what you are thinking. HOMEWORK, NO WAY! Honestly they should give you something SMALL to work on weekly that you are able to do quickly and in a fun matter with your child. This week our speech homework is while reading the book Brown Bear Brown Bear, which is a favorite right now, practice saying "me" when reading the book. That's our end goal for the week. By therapists giving your child homework that shows that they KNOW your child and that they PLAN for your child! This is a fine line in my book as an educator. We want to give parents hope for the future but I have been in meetings where the parents are not given the actuality of what is going on. The teacher thinks she/he is doing a great job because the parents are happy! Of course they are happy, you weren't talking about their child, it was a better version of their child! You need therapists who are positive and you leave their office feeling better, not worse! They should be giving you and your child encouraging words along the way. We need those positives just as much, if not more, than our children do! My therapists are always telling me what a great job my husband and I are doing and always point out something good at each appointment. Again they are not giving us false hope, as the homework keeps coming and we know it's a long road ahead, but they are giving us hope and positive thoughts to get us through the day and week before we meet again! These are just some of the things that I look for in my child's therapist. Take a look at your child's therapist, or yourself, and see how many of these qualities you/they possess. Therapists and parents partnering together is so important. We all need to hear some positives, it keeps us going! If we listen to each other with our hearts as well as our heads, wonderful things happen for children. I look forward to hearing more about you and your daughter's journey and progress.